At last, a toy with crossover appeal! That is just superb! 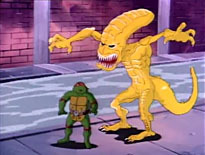 This exclusive is an homage to an old episode of the Teenage Mutant Ninja Turtles cartoon - in Season 2's "The Case of the Killer Pizzas," Krang gives Shredder some Dimension X eggs that resemble meatballs; when they hatch, they grow into big yellow monsters that were designed as an homage to xenomorphs. So it's fun that this bio is so jammed full of homages of its own. The outpost station? The episode debuted on the fifth of November, 1987 - 5/11/87. "Wolf stars" aren't a thing, so that's a reference to Murakami-Wolf-Swenson. Microwave radiation? The eggs hatched when the pizzas were microwaved. Seeming right at home in the sewers? Well, that part's pretty self-explanatory. Still a hoot, though! The unnamed pizza monster in the cartoon didn't really look like an Alien: it was just a stylistic homage. 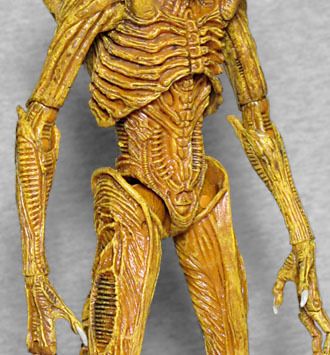 Doing that would have required a completely unique, one-time-use mold (well, maybe two-time-use, but we'll get to that), which would have vastly increased the price of this limited exclusive, so NECA used one of their existing molds: the Series 7 AvP Warrior Alien. And hey, we haven't reviewed that one, so this is new! The Aliens vs. Predator xenos were played by actors in suits, but this sculpt exaggerates things - it's more about how we're supposed to see them, vs. how they actually looked. 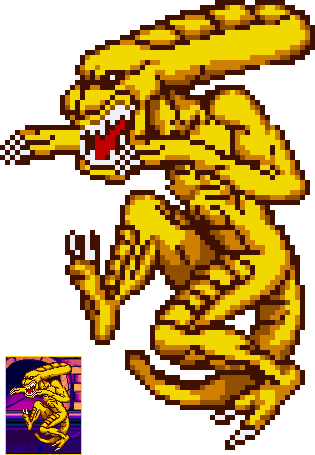 Compared to the Aliens alien, the legs are longer and thinner, the ribcage is higher and more compact, and there are no weird bars connecting to the elbows. The hands have two fingers and two thumbs, and the feet follow suit. We get the usual Alien striations and ribbed panels, and the ridge running back his tail forms a bit of a fin. 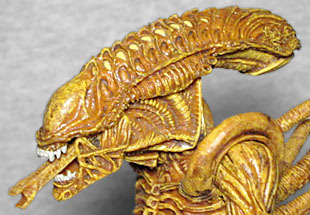 The head comes from a different source: the AvP: Requiem Alien. Why bother doing that? Because the AvP Alien had a smooth dome, while the Requiem one is lumpy and ridged. Does that really make a difference? Uh... maybe? The Pizza Monsters did have lumpy heads, so this can kind of make sense, but they also had visisble black eyes and no second internal mouth, so "accuracy" has a real limit here. 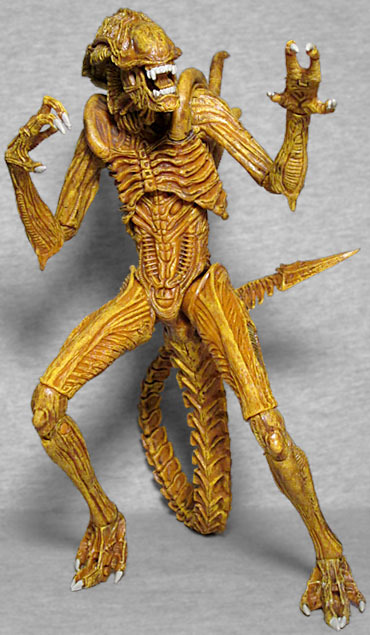 The Sewer Mutation Warrior Alien has hinged toes, balljointed ankles, a hinged lower knee, swivel/hinge upper knee, swivel thighs, swivel/hinge hips, balljointed chest, hinged fingers, swivel/hinge wrists, double-swivel/hinged elbows, swivel/hinge shoulders, a balljointed neck, hinged jaw, and a bendy tail. If you had passed on this when it was available alongside Jungle Briefing Dutch at SDCC, and later decided to get a cheap bootleg version from China, perhaps on Singles Day, you might find that a few of the swivels are minorly loose, some of the balljoints pop out easier than you'd expect, and that the jaw can't hinge open very far before bumping into the top half of the head, but that otherwise everything works just fine. Oh, and you might - in theory - have to pull the top of the head off and reglue it straighter so the tongue doesn't fall out. If you got NECA's "cartoon colors" TMNT set, it kind of makes sense to get this figure to go along with them - even if the design doesn't match exactly what was seen in the show, and the differing levels of detail in the sculpts will never blend together. But do you recall when we said that a new sculpt could have been used twice? The creature showed up as the "Pizza Monster" in Level 3 of the Turtles in Time videogame, meaning that NECA could have given (this imaginary new mold we made up) blocky paint apps and made it fit in with the "arcade colors" Turtles, as well! There's one more feature that really adds to the coolness of this figure, but would have been easily overlooked and never would have been missed had it been absent: the paper insert behind the Alien in the clamshell has the usual Aliens logo at the top, but below that the artwork shows the bricks of some shadowy sewer - it's a tiny piece of diorama to help set the stage! Didn't need to be done, but it's really cool that it is. 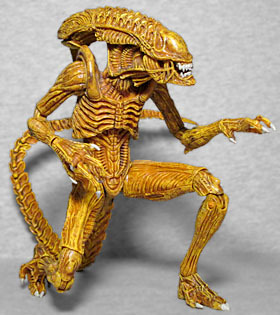 The only reason I was initially interested in this figure is that I already had the "ketchup" Alien from the Genocide two-pack and wanted the "mustard" version to go with it. And honestly, that's still the only reason I finally opted to get one (when the price was low enough). It's an interesting piece, but not a must-have.